Today was the big trip to Machu Picchu, the biggest highlight of our Peru trip (of course, there are other awesome things to see). We took the Vistadome from Poroy (about 40 mins from Machu Picchu by car) to Aguas Calientes, which is about half hour from Machu Picchu. One thing that the train really had? Windows. Lots of them. 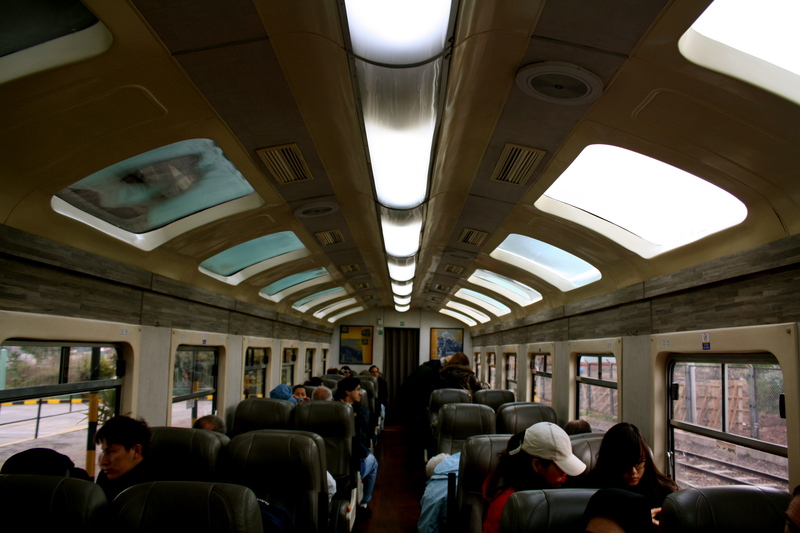 Apart from the usual windows by the sides to allow you views of the passing scenery, they also had windows to the top. Another thing I didn’t expect – breakfast! 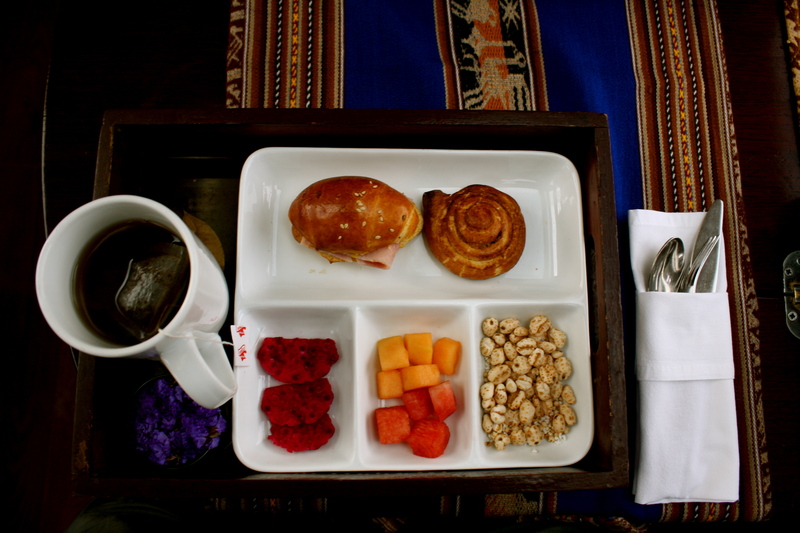 It was a fancy-looking breakfast, served in what looked like a bento box. That was a nice surprise. 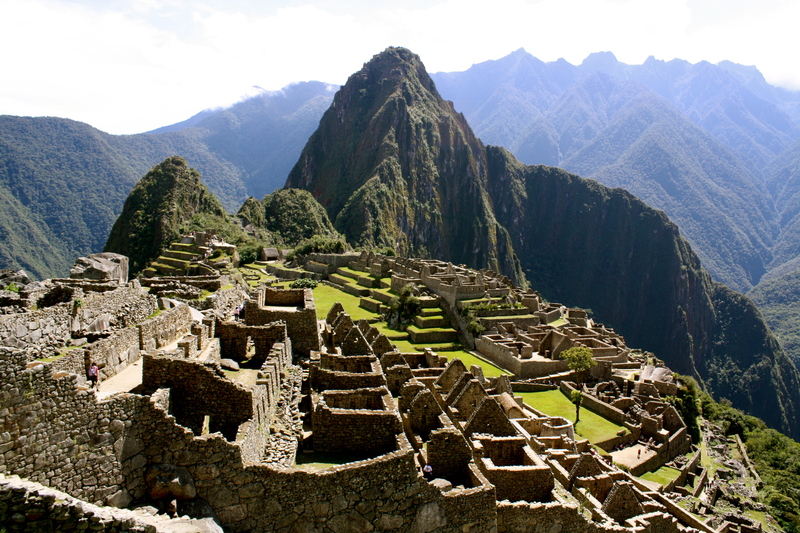 The one-way ticket to Machu Picchu costs about 75 USD. Despite all the warnings about the long lines, and our craziness to try and prep everything in advance, it was surprisingly not as busy as it was made out to be. So if you are going sometime in June, and doing the train way (I heard the hiking part is still booked up), you might not need to go too crazy with the prep, and just take your chances a little. Btw, all that Lonely Planet talk about checks on bags for water and food – never happened. While you might not want to be packing a picnic, some snacks and a small bottle of water probably would slip through the games undetected. I’m not sure if expectations is a good or bad thing. If you were just walking around the mountains, you’d never guess there’s a whole city in those mountains amidst the clouds. But I guess since we knew what we were looking for, that takes some of the fun out of that. Anyway, it is pretty hidden. As we were walking, we pretty much never had a clue when the next turn will bring us to Machu Picchu. But when it did appear, well, it looks like the postcard pictures! 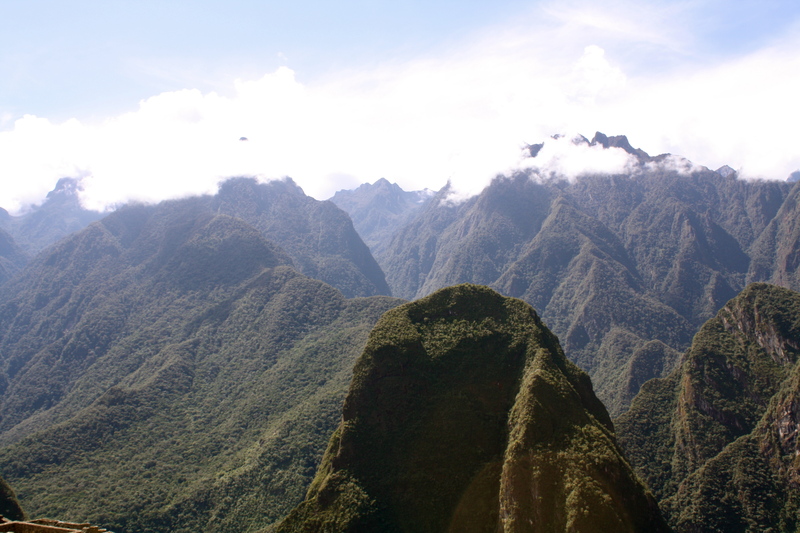 I think my main impression of Machu Picchu was how small it was. When we first booked the trains, we were afraid that doing this as a day trip might not be that great an idea, and that we might not have enough time for everything. Turns out the train timings were there for a reason, anyway. It was pretty small, and as long as you are not trying to explore every nook and cranny, a day trip was enough. While Petra was massive, and definitely required multi-day trips, the same can’t be said for Machu Picchu. I don’t have any real guide to write about the Machu Picchu. It is pretty much a city whereby there are ceremonial quarters, living quarters, which are segregated, and some terraces for planting stuff. It is hard to tell which is which without a guide. But, one thing to do – do climb higher up on the terraces, so you can get a bird’s eye view, and a good shot of the city. 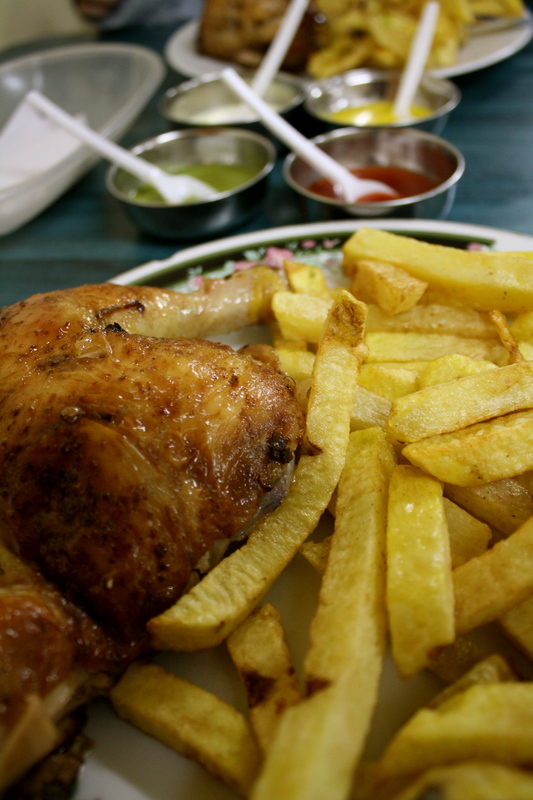 After about 4 hours, we were beat, and we made our way back to Aguas Calientes for lunch. I had a cream trout – apparently, I can’t tell the difference between salmon and trout. It was pretty expensive, at about 16 USD. But we were paying for the view at the restaurant (can’t remember the name). Despite all the writing about there being nothing in Aguas Calientes, I am not about to jump on the bandwagon. It is what it is – a stop for those on the way to Machu Picchu. While things are overpriced, it’s not a seedy or horrible town, and you could do a lot worse when you are hungry and tired. They have plenty of restaurants and cafes that serve up decent food, and when you are want to send that postcard you just wrote, they have a post office for you, too. Finally, time for us to go back. Instead of the Vistadome, we took the Expedition, which was slightly cheaper at around ~50 USD. It really wasn’t much of a downgrade, and they served us snacks and a drink. Some pleasant things did happen. In our cabin, the lights apparently shorted, and so, it went out a couple of times. While everyone else was scrambling for light, confused by the sudden darkness upon us, I looked up at those large windows, and enjoyed the stars, which I hardly ever get. It was worth it. Dinner was a cheap roast chicken place, and we had some delightful roast chicken for about 3 USD.